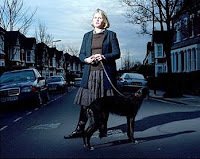 Documentaries don’t get much better than My Street –Sue Bourne’s portrayal of life in the street on which she lives. 116 front doors. Yet after living on the street for fourteen years, Sue Bourne knew very few of her neighbours. First broadcast on Channel 4’s Cutting Edge strand back in February, My Street records the faces and stories behind the doors, residents who let Sue over the threshold to permanently put their lives on the record. If you’re lucky, the documentary will still be available for free streaming/download on 4oD. She met a fantastic range of characters people. Some lived alone. Others shared with a bewildering and fluid number of people – like the Kiwi house! Medical problems. Social housing. Musical ability. Happiness, but much sadness, and loneliness. And along the street, Sue discovered that pockets of community existed. A rota of people taking a cancer sufferer for his daily radiotherapy. Suddenly the street wasn’t as anonymous after all. Which makes me wonder about my street, and the depth of relationships that I don’t have with my neighbours. And wonder about Titanic Quarter again, and the two thousand apartments being built over the coming years. What sort of community do we live in? What sort of community are we building? What sort of community do we want? Mid-December. Holywood Exchange. Remember the phenomenal traffic jams that clogged up the Sydenham Bypass arterial route from early morning until bedtime. People camped out. Well, it was in the imagination of a certain retail outlet, the traffic police and the media as they prepared us for the opening of Ikea at Holywood Exchange. The opening ceremony was a reasonably modest affair, although thousands of people did visit the store stretched out across the first day of trading. Even I squeezed in briefly on the first night on the way home from grabbing some now-forgotten essential item from Sainsburys. 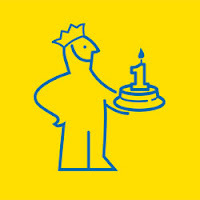 To celebrate their first birthday, Ikea Belfast are hosting a party on Saturday 13 December. There will be “face painters, balloon modellers and a jolly jester” ... and for the children, a Santa and elves in a grotto (£5 for a photo and a present). If you come “dressed up in Swedish style” (perhaps a big chef’s hat? ), they’ll give you a gift card, and there’s a £10 voucher waiting for you if it’s your birthday too. And it’ll be a good opportunity to check out the Harvey Norman (and Next Home?) stores that have recently opened up next door. Just watch out for the traffic … the tail backs at Knocknagoney on the way home could be crazy if Tesco haven’t finished their construction work by then! On Thursday night I went along to Yorkgate Moviehouse (in the process of being renamed City Side) to see Hunger before it comes to the end of its run in the local cinemas. I don’t really go to the cinema to be entertained. Not every time. Life would be saccharine-coated if all literature, films, radio and TV was about making me chuckle. Thought-provoking and eye-opening is good too. Hunger is an unusual film. Really a series of vignettes strung together. Slow and stark, sparse dialogue and completely devoid of a musical score. Yet the film’s all about tone, observing these snapshots of life ... and death. You know the story before it starts. Well, you know the ending. But anyway, be warned: spoilers ahoy! So we watch the morning routine of Raymond, a prison officer, leaving home on a crisp winter morning, checking under his car while his wife watches anxiously out the living room window. Smoking in shirt sleeves outside in the snow. A new IRA prisoner Davey arrives, refusing to wear prison uniform, and discovering the reality of the dirty/no wash protest. Long lingering gazes around the cell, taking in the "artwork" ... that I wonder whether director Steve McQueen had a hand in? The pile of rotting leftover food and the maggots in the corner of the cell, a hiding place for contraband that would never be disturbed by the prison staff. While Dolby smell-o-vision has thankfully not been installed in Belfast cinemas, the stench of the cell was obvious. Now I’m not liberal enough to expect a holiday camp atmosphere for incarcerated terrorists and murderers. And in an establishment that runs by discipline and control, there has got to be some authorities reaction to prisoners refusing to obey the local rules – whatever the ins and outs of the situation. And if prisoners struggle and kick out then they will be held tightly. But the sheer brutality surprised me. Being hauled out of a cell and knocked out against the wall. The bath time scene was perhaps the worst. Prison officers in riot gear, with plastic shields and truncheons, beating prisoners as they headed down to have orifices and mouths checked for illicit goods (in that order with the same gloved finger) before being hurled into a bath and scrubbed with a brush. The dirty protest following on from the first hunger strike was obviously an extraordinary time. But if the portrayal is at all accurate – and I don’t hear anyone or any organisation claiming that the scenes written by Enda Walsh and Steve McQueen weren’t realistic – then humanity and dignity of both the prisoners and the prison officers had all but vanished. Throughout the film, there was a sense of loneliness. The featured prison officer, Raymond, had little relationship with his colleagues. It couldn’t have been an easy place to work. And it must have marked people for life, destroying their optimism, killing their soul. Weekly mass was about the only time the prisoners got together – mostly spending the time chatting, planning and encouraging each other, rather than listening to the words of the priest. There was a beautiful scene of a prisoner interacting with a fly on the cell’s window grill, trying to get it to walk over his hand. A human being seeking companionship from where he could get it - a pet fly. There are two deaths in the film. One is the murder of an off-duty Raymond – eleven prison officers died during the period of the two hunger strikes and the dirty protest. The other death – Bobby Sands – takes up the second half of the film. There’s a change of pace for a while as Bobby meets his priest. Much has been made in the media about the twenty minute unbroken scene as Michael Fassbender (Sands) and Liam Cunningham (priest) sit opposite each other in the visiting room. It’s unrushed and in keeping with the rest of the film. There’s humour and banter, as they chew the cud and talk about the pressures of having more than one priest in the family. As the priest goes about his “business of the soul”, Sands presents his pitch for the prisoners’ next step. Having been promised their own clothes, the prisoners were presented with clown outfits. The republican leadership on the outside isn’t going to win the battle for the prisoners inside. And whereas everyone joined the first failed hunger strike at the same time (and consequently all got weaker at the same time), Sands explains that the second one will be more organised. Starting at two week intervals, with a knowledge that it will be the relentless build-up of death that will bring about change. When challenged by the priest that he’s really planning suicide, Sands rationalises it against a “pure” cause and a sense that it will provide freedom. The final stages of the film strangely bring back a warmer sense of humanity. The medical orderlies tending to an emaciated Sands. Putting lotion on his sores. A sheepskin rug under the sheet. Fresh food appearing at meal times to be ignored. Eventually building a cage around him on which to rest the blanket. BJ Hogg appears – must be in the contract when you get money from NI Screen! – and slightly bursts the bubble. But there’s gentleness and compassion for the first time in the film. In the final days, Sands’ parents move into a nearby room. And many tears filling up in eyes across the cinema. Sands died after 66 days without food. Nine prisoners died on that second hunger strike. So a film about being trapped – whether in a job or a call. About being lonely and isolated. About suffering. And a film about endurance – whether sticking in a job, following an ideology, or watching your child starving themselves to death. 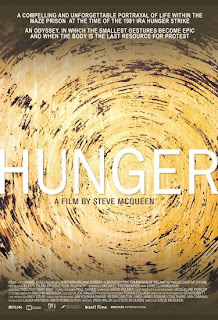 Hunger is the first British film to win the Caméra d'Or (for best first feature film) at the Cannes film festival. There’s some beautiful camera work ... without falling into the trap of being too obviously artsy. And a graininess to the print – lines running up the middle of the screen for most of the film – not sure whether that was Yorkgate’s print or a deliberate effect? And unfortunately, the image wasn’t centred on the screen at Yorkgate screen 7, with a good 8-12 inches being projected off the left hand side of the screen – which really affected the symmetry that had been so carefully set up in the long Sands/priest dialogue. I was living in Lisburn – not far from the Maze – and in P4 when all this happened. My memory is not of the hunger strike itself, nor of Sands being elected as MP for Fermanagh and South Tyrone, but of the black flags tied to the telegraph poles as we drove across to Westport for a holiday that summer. So I’m glad I took the opportunity to go and see Hunger before it leaves the big screen. A bit like the recent Breakout documentary on BBC NI, it fills in a bit of history that was missing, a whether it’s totally accurate is less of an problem for me. And I wouldn’t judge it to glorify the IRA prisoners, nor the prision service. It’s one story, amongst many. And maybe I’ll hear some of the others being told in the coming years to fill out the story. I’ve previously mentioned the BBC Four revisioning of The Quatermass Experiment that was first shown in 2005 as a hundred-minute live drama, and was recently repeated at the beginning of October. I’ve also mentioned reading a Quatermass novel, bought in the second-hand bookshop that used to be tucked in behind Stewarts supermarket in Lisburn’s Graham Gardens. Only problem was that the last page was missing! 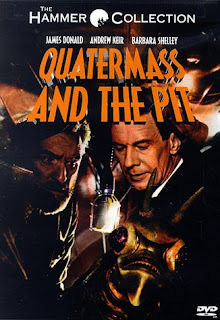 ITV are showing the original 1967 film Quatermass and the Pit in the wee small hours of Sunday night, between 02:15 and 03:55. Seems to be scheduled across most of the ITV regions. If you’re videoing/PVRing the programme, I’d recommend starting the recording early, and finishing at least 10 minutes after the published time as middle-of-the-night programmes float around a lot in the schedule. Wish I could remember from where I picked up the link to this four minute video earlier today ... but it's a great concept for a short film. Cheryl Wonders posted an allegorical tale ("Best Interest") about the PMS story. Update - And Crookedshore didn't mince his words when he asked "Weal human beings continue to be sacrificed on the altar of institutional survival?" And on Thursday he followed up with an open letter to the PCI Moderator, Clerk, PMS savers and ministers. Update - December - As a saver in the Presbyterian Mutual Society, GroovyJon has started a PMS / PCI blog to track what's happening. Earth calling the Belfast Telegraph’s subeditor or whoever was in charge of page layout in their Saturday paper. Is there anybody there? A full page exploring the ups and downs of the International Space Station. Borrowed as page filler from its sister paper, The Independent where Steve Connor is the science editor. But what’s that down in the bottom left? 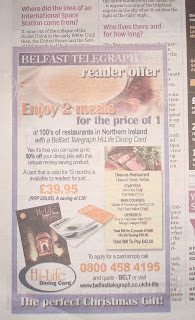 A Belfast Telegraph reader offer advert dropped on top of the article. Right on top. Completely obscuring the text of the article. Does no one check the paper before it hits the news stands? Not the finest moment for Northern Ireland’s largest daily paper. I don’t want to reopen another teabag thread of posts. But Sainsburys’ labelling does throw up a question or two. The Saturday morning conundrum was whether to buy a pack of 3-5 chicken breasts or a bigger pack of 5-8 breasts. The two different sizes of pack were sitting next to each other on the shelves. Both were viable options for the week’s catering requirements. Of course, the mathematician in me reckoned that price per kg would be a way to make a decision. £7.98/kg versus £8.74/kg. Easy. But what’s that up at the top of the larger packet? The “special purchase” (£7.98/kg) seems to override the “better value” (£8.74/kg) of the other pack. While it may not count as improper labelling, it is confusing and disingenuous. Unless you define “value” differently to me! PMS ... not so mutual after all? I wasn’t going to make any comment on the difficulties surrounding the Presbyterian Mutual Society (PMS). But as the story unravels, and as I discuss with Cheryl Wonders, I do have a recurring nagging thought on the matter. The background is that the PMS has existed since 1982, providing a lending and investing facility to Presbyterian congregations and their (Presbyterian) members. Unlike better known financial institutions, PMS didn’t trade on stock markets or invest in other institutions. Instead, it seems to have invested in retail properties in England and brought in cash from rent. And thus, it seems to have been largely unscathed by the first order effects of the recent financial market volatility. The other key difference is that unlike banks, building societies, credit unions and most other mutual societies, PMS isn’t regulated by the Financial Services Authority (FSA). When individuals and congregations realised that their funds invested in the PMS were not covered by the government guarantee scheme (FSA), funds were withdrawn and lodged in more traditional institutions that were guaranteed. The second order effects were the ones that got them. It is apparent that the credit crunch has had a severe effect on the Society. A number of members have moved funds from the Society to other financial institutions that enjoy protection under the Government's financial guarantee scheme, leading effectively to an unprecedented run on the Society's cash which it could not sustain. There are questions about whether the denomination encouraged Presbyterians to invest in the (legally separate) PMS. I’m not addressing that issue in this post. A mutual society exists for the benefit of its members. There are no external shareholders to be paid. Profits are only big enough to ensure the stability of the society. The PMS existed for borrowing and saving. I’ve never had money in the PMS, though I have friends who do. But I’d characterise the act of withdrawing invested cash from the PMS as one that was not in keeping with the mutuality of the society’s aims. While it may have been a sensible move for the most financially astute members to figure out that they could shift their money somewhere even safer, the (probably unforeseen) consequence of their action was to look after themselves, and put others who were less genned up at a disadvantage. According to a page on the PMS website that is no longer available, the society “is managed by the Board of Directors comprised of experienced and respected ministers and laymen of the church who undertake this responsibility for the mutual benefit of all its Presbyterian investors”. After talking to someone last night, I wonder how many of the PMS directors had money invested in the society during the summer, and how many still had money in it now that the shutters had come down? Part of me hopes that none of them had money in it, and that insider trading could not have been an issue. But mainly I wonder – though I’ve no evidence – how many of the withdrawals came from church committees? Did groups of Presbyterians vote across Ireland to protect their own interests and investments? Then there would be no need for discussion about pastoral care and a potential hardship fund. No need for the Administrator to figure out how much money could be raised by a fire sale of English retail units. It’s a Presbyterian mutual society, a kind of private denominational finance club ... maybe it’s time for Presbyterians to think mutually again? Mapgirl - the blogger behind NI Confidential - will have been tired this morning. She hosted a Thanksgiving dinner last night in the impossible-to-spell but wonderful-to-frequent Errigle Inn. While only living in Northern Ireland since February, she's amassed an amazing number of friends, and many of them converged on the Ormeau Road last night. Now there can be parties at which no one really knows anybody else, and everyone stands around in tight huddles talking to their partners and scared to hazard any more than a quick "hello" to the strangers around them. Well Friday night wasn't one of those evenings. Badges were worn, people mixed, history, holidays (I'm now reading up on the history behind Easter Island) and hopes were shared, turkey was guzzled, enormous slices of apple pie were stuffed into mouths, and fun was bad by all. The time flew. There was a high density of bloggers (occasional, as well as the more obsessive), and a scary (perhaps, embarrassing) number of people who appeared to read this blog. Hello! Mapgirl - thanks for giving us such a wonderful and memorable evening! Happy Thanksgiving. The IT Crowd is back for another series on Channel 4 at 10pm tonight. Last year’s series allowed Jen, Moss and Roy out of their basement fluorescent-lit lair and showed them interacting in the outside world. It’ll be interesting to see if Richmond will be back behind the Red Door, or whether his self confidence will continue to blossom out in the community. I'm sure Pete Baker will shortly make a longer comment about it over on Slugger, but there's breaking news that Nasa have lost misplaced one of the two spiders that were ferried up this week on the Shuttle to the space station orbiting the Earth. The Times have published a beautiful article explaining the whys and wherefores (should that be curds and whey?) of this arachnoid adventure, together with some commentary on the art of zero gravity web-spinning. ... the lead spider is so confused by the zero-gravity conditions that it has filled its tank with a tangle of silk to try to stop itself floating around and cure its space sickness, obscuring the search for the runaway. The pair were prepared for their space adventure by scientists at the University of Colorado who hope to help answer school children’s questions about how spiders spin webs in space. The answer would appear to be, ‘with difficulty’. 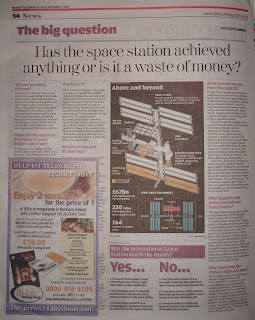 Spinning his way out of the crisis to listening media, Kirk Shireman - Nasa’s deputy space station programme manager - told the Times. “I’m sure we’ll find him spinning a web sometime here in the next few days." They're a lot less likely to find the tool kit that drifted off earlier this week. Let's hope they take more care with the Buzz Lightyear toy that made the trip up with them to the space station in June. Would you like your name, address, phone number, email address and occupation published on the internet? One response to this post’s title is that quite a lot of people have irresponsibly open Facebook profiles that expose these kind of personal details for all to see on the open internet (or for anyone to access with only a few minutes effort). But what about involuntary disclosure? Let’s be clear: I’m no fan of the British National Party. It beggars belief that there’s a market for such narrow-mindedness. The party’s policies and its members’ views veer towards ideologies and mindsets that are exclusive, intolerant, with a heavy dose of historical revisionism - all serving to devalue humanity. But it’s a political party, and it’s not proscribed. And while I don’t like it, it’s perfectly legal to be a member. Though it does seems to be more embarrassing to be "outed" as a BNP member than if you were a member of the Alliance or Labour parties. And its members don’t deserve to have their personal details - names, addresses, phone numbers, email addresses, occupations - posted all across the internet. It’s an unwarranted invasion of their privacy. Some people and addresses listed may be targeted with less-than-friendly communications over the coming weeks and months. It’s also an out-of-date list (accurate to Nov-Dec 2007) that won’t reflect people who’ve changed their minds and given up their membership. And it is difficult to be sure that non-members haven’t been maliciously added to the list before publication. So innocent people may suffer too. I’m not sure if there is a silver lining to this particular cloud. The publication of the membership details will probably open up a debate about the ethics and stand of the BNP. The oxygen of publicity could galvanise support as well as expose majority opposition. But I fear that the BNP will be driven into greater obscurity with decreased accountability and significantly less visibility of their party actions and policies. Driving the BNP underground will not be a good thing. There will probably also be a debate on the circumstances in which certain professions can ban affiliation political parties - whether a total ban or some difficult justification of why particular (legal) party membership can be prohibited (as is the case for police officers and prison warders). Of course, the inevitability is that the news cycle will quickly move on ... and already the next controversy is hitting the headlines - John Sergeant is pulling out of Strictly Come Dancing! Why did no one mention that The Avengers and The New Avengers are being shown again on BBC Four at the moment? I have distant, but very happy, memories of watching The Avengers in black and white in the 1980s. Was it early evening on BBC Two? More likely Channel 4. Memories of John Steed (played by Patrick Nacnee) wandering around psychedelically-decorated sets (you can do a lot with spinning black and white!) 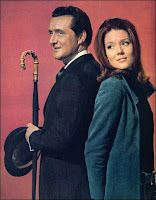 which looked like giant board games, with his bowler hat and dangerous umbrella , accompanied by the leather-clad Cathy Gale (Honor Blackman) or Emma Peel (Diana Rigg). Taking orders from “Mother”, and driving classic cars. If you’re in need of nostalgia, check out the programme times for the two related series. The long-awaited application to extend the runway at George Best Belfast City Airport has been submitted. This news follows on from last month’s capacity increases in the number of annual flights (48,000) and “seats for sale” (2 million in and out) at the harbour airport. An extra 590m in front of Ikea and Holy Wood Exchange would allow existing aircraft to take off with a full load of fuel and passengers, allowing them to reach further away European and Mediterranean destinations direct from Belfast. 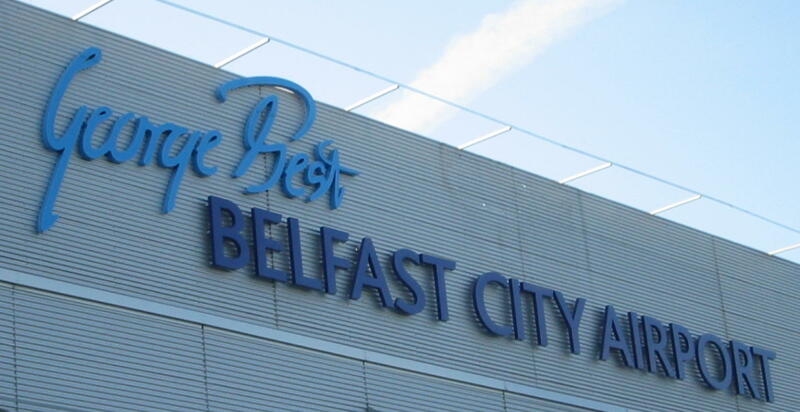 “We also want to publicly reassure people living in Belfast or close to the flight-path that the runway extension will not involve an increase in flights or a change in the opening hours of the airport. The current planning agreement restricts operating hours from 6:30am to 9:30pm daily and caps air traffic movements at 48,000 per annum. Every now and again there’s a big change in the kind of electronic devices that businesses and consumers want to buy. Usually a firm markets something that breaks the mould, or reshapes an existing product to allow it to fit previously unseen situations. Laptops have been around for a long time. The first ones were more luggable than portable. Closer to fitting a handle to a normal desktop unit! I remember taking a laptop home from work to provide remote support over a weekend. If you’d put a 1999 Toshiba Tecra into a plastic bag, it would have fallen through the bottom of the bag as soon as you lifted it! When Asus launched the Eee PC this time last year, there was a sudden demand for their cut down handbag-sized subnotebook or netbook. Out of the blue, it was acceptable to use a device with a small 7” screen, solid state drive (if you drop it you don’t wreck the hard drive), built-in wifi, integrated camera/mic and a simple set of bundled software (OpenOffice running under Xandros Linux on the majority of models) that you’ll use but not add to. The next stage of development is to move beyond wifi, and bundle 3G-like services with netbooks. So rather than being limited to locations with wifi hotspots that you can (afford to) access, you can take advantage of the ever-increasing 3G coverage. But without having to permanently tape a 3G USB dongle to the laptop case! So netbooks are now starting to be sold with 3G data subscription bundles. Just slide in the SIM card, take out a new mortgage and off you go. And here we get to the point of this post. Vodafone UK are sending “LiveGuy” around the country wearing a lurid red sweatshirt. If you spot him and you say the magic phrase (lots of clues online as to his location) he’ll hand over one of the four Dell Inspiron Mini 9 netbooks [deep voice] “with built-in mobile broadband from Vodafone” he has to give away each day of his tour. But if you’re reading this in Northern Ireland, don’t get too excited. You’ll not need to know the winning phrase. His UK tour doesn’t involve getting any ferries across to visit a city near you. Vodafone wimping out from visiting us. alaninbelfast: @vodafoneliveguy Not coming across to Northern Ireland? Shame on you. Your tour's not complete! We do have Vodaphone 3G in NI! 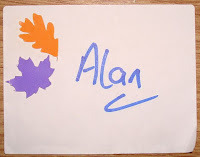 vodafoneliveguy: @alaninbelfast you're not willing to cross the seas to get a free netbook? where is your dedication? Only the strong willed succeed. Maybe we’re technically backward on this side of the Irish Sea? Cave dwellers with no electricity to recharge the batteries of their laptops. Maybe he wouldn’t understand our accents when we talked to him. If you were flicking around their satellite or cable channels during the US election count last week, or surfing online and reading reports of the coverage, you’ll have come across CNN’s gimmick of the night. It was CNN senior vice president David Bohrman’s idea, and much of the technical nous came from Vizrt and SportVU. Take 1 green screen tent (called “Casper” after the friendly ghost), 35 HD cameras in a 220 degree arc, telemetry from the main studio cameras sent to Chicago so that a suitable angled image of Jessica could be stitched together and sent back for insertion into the main feed. Oh, and a 3 second delay for the segments of the show featuring the hologram to cut out the delay. Then break for an ad and reset the delay to nil. SportVU originally started to develop their technology to allow instant replays to “orbit” goals at major sporting events and see the action from a range of perspectives. And in the end, the second holodeck built in Arizona near John McCain’s election night rally wasn’t used. For technically interested or curious readers, Broadcast Engineering have uploaded a podcast interview with Vizrt’s director of usability Nir Goshen, discussing the mechanics of how they pulled off the hologram. 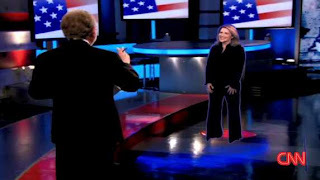 Turns out that the quality of the “hologram” was deliberately diminished. It could have been a close-to-HD image looking like the reporter was actually standing in the studio. But CNN took the editorial decision to make sure that viewers understood that it was a hack, and they followed the pattern of Obi-wan in Star Wars by adding white noise, faded edges and even gave it a glow. The US are going through a Digital Switchover exercise at the moment, switching off analogue terrestrial signals (or replacing them with a test card message explaining where all the moving pictures have gone). Subscribe to the Broadcast Engineering Podcasts if you want to follow DSO progress in the US ... and they sometimes mention the UK too. Lord Timothy of Belmont has been blogging about his recent conversion to Freesat, allowing him to abandon his old Freesat-from-Sky satellite package. Also throws in a useful recommendation for Adrian from Ultrabeam Aerials. The PVR (hard drive recording) Freesat set top boxes didn’t arrive over the summer as originally announced when Freessat launched. But Humax have now confirmed that their High Definition PVR box - FOXSAT-HDR - will be on sale in November to hit thre Christmas market. Lord Belmont went for the mammoth (22.5kg) integrated Panasonic LCD television (TX-37LZD81) that comes with Freeview and Freesat tuners built in. No need for a separate set top box, unless you want to add a hard drive recorder ... or when Freeview switches from DVB-T1 and MPEG2 to DVB-T2 and MPEG4 as it might over the next few years to allow better use of the limited terrestrial bandwidth and squeeze some HD channels into the Freeview lineup. It’s that violent time of the television scheduling year! So I know that technically the film 28 Weeks Later didn’t feature zombies since the “Infected” were still alive. But it’s my closest point of reference to E4’s Dead Set that was shown a week or two ago. 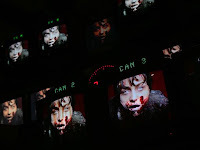 Written by the Guardian’s TV reviewer Charlie Brooker, the zombie, horror satire is set inside the Big Brother house. It’s eviction night, but something goes wrong. Riots break out across the UK, forcing the live eviction show to be taken off air and replaced with a special C4 news bulletin. But as the eviction goes ahead outside the house, zombies run amok amongst the crowd. Soon the madness is erupting in the production areas, and works its way into the camera runs. Kelly – a runner on the show – seeks refuge in the BB house, though the contestants mistake her for a new housemate (albeit covered in blood and more tense than normal). There’s a zombie Davina, a variety of violent methods to smash the head of a zombie (seems to be the only way to kill them), and a great ending. Not the usual squared-eyed fodder for AiB, but jolly good TV if you can stomach a bit (a lot) of gore. For the PC/Windows users out there, it’s still available to watch online (there’s a feature version or else the five episodes) or for free download via 4oD. Spooks is back on BBC One. That’s grown up Spooks and not BBC Three’s baby Spooks - Code 9 spin-off that took a while to warm up by the end of series. The first episode lost a major character (careless! but not unusual), the second was a lot less tense than normal, and the third show was back with its sinister, chest-tightening soundtrack and the countdown to disaster and split second redemption. It's the time of the year again when you burn heating oil faster than you can buy it, and wish that Toyota Aygo's warmed up as fast as the old Smart car used to! And even the bottles of Innocent Smoothie in Secret Sainsburys have got their woolly hats back on. Love all the variety and the mohair. Over half a million hats knitted by members of the public and sent into Fruit Towers. Each bottle sold adorned with the creations of The Big Knit results in a donation of 50p to Age Concern. And a further 20,000 hats knitted in Ireland with a €1 donation to Age Action Ireland. Before the US President-elect comes out to speak, the conceding candidate gets to talk to gathered supporters and the watching/listening country. It’s their last chance to communicate to a captive audience. It’s their chance to set a tone. It’s their chance to draw lines under past behaviour and activity. It’s their chance to rise above the debris of a campaign and remind people why they were a candidate in the first place. 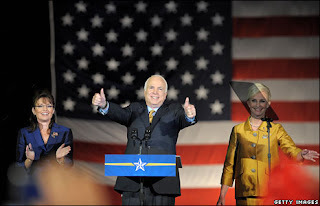 For me, John McCain nearly stole the show last night when he stepped out on the stage on a “beautiful Arizona evening”. There were no weasel words. No looking for chads on the floor. He even seized the moment to remind Republicans that they had no reason not to celebrate an African American president winning the White House. It was a completion of something they too aspired to. And it was good for everyone. “This is an historic election, and I recognize the special significance it has for African-Americans and for the special pride that must be theirs tonight. I've always believed that America offers opportunities to all who have the industry and will to seize it. Senator Obama believes that, too. But we both recognize that though we have come a long way from the old injustices that once stained our nation's reputation and denied some Americans the full blessings of American citizenship, the memory of them still had the power to wound. Turning back to the campaign, he took personal responsibility and delivered a remarkable line that didn’t mention the party, or his strategists, or his running mate, or the economy. After all, the history books will tell a different story anyway! Towards the end of his speech, he came back to his actions and personal liability. And then finished with gracious words. It’s patriotic, but not so much that it loses its humanity. The standard template for a concession speech is softened by describing Joe Biden as “my old friend”. “This campaign was and will remain the great honor of my life. And my heart is filled with nothing but gratitude for the experience and to the American people for giving me a fair hearing before deciding that Senator Obama and my old friend Senator Joe Biden should have the honor of leading us for the next four years. I would not be an American worthy of the name, should I regret a fate that has allowed me the extraordinary privilege of serving this country for a half a century. Today, I was a candidate for the highest office in the country I love so much. And tonight, I remain her servant. That is blessing enough for anyone and I thank the people of Arizona for it. During the speech, when the disappointed Republican crowd booed, McCain hushed them. It was over. No need for further pantomime. Obama was no longer the opponent. He was the next president, and that demanded respect. 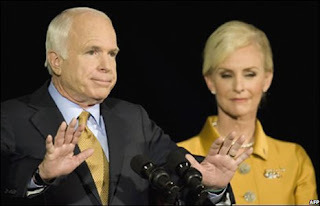 Did McCain say that the party needed to pick itself up, reform, reenergise and prepare for government in four years time? No. He looked forward to what the current election result would bring. Setting a positive tone for his supporters. And setting the positive tone in which history will probably now remember McCain. Which comes to his penultimate point. And in a parallel world, I wonder what Obama’s concession speech would have said? With a decent electoral mandate, the Democratic party now has the chance to put its words into actions. But as Gordon Brown knows, leadership is all about dealing with the unknown. Hundred day plans do off the rails within the first ten minutes. America’s new wonder-boy president will be imperfect. He will inevitably make mistakes. At times, he will be incredibly disappointing. But can be keep his head while all around lose theirs? Can he earn the label of being a great president to replace the too easy badge of first African American? Season Eight of The West Wing is about to begin! Only this time, it’s live. There have been a couple of wobbles over the last seventeen years, but I’ve generally found the Ulster Bank to be a reasonable place to hold my personal account. They’ve never felt like the bleeding edge of the personal banking world. it took them a good long while to offer online services. But the cheque books keep arriving, and they’ve always refunded the occasional bank charge when I’ve phoned up to query why it has taken so long for my money to lodge but so quick for them to give it away to other institutions. Why when I try to lodge a cheque in the Belfast city centre headquarters do they have to post it up to my branch on the University Road for it to be processed and lodged? In one way it serves me right for submitting a Euro receipt for a six-person meal in a Dublin hotel’s bar into a UK expenses system. I never expected to be reimbursed with a Euro cheque! Next time, I’ll wait for the credit card statement to arrive and claim back the Sterling value. But in an age of uniform processes being followed at all of a bank’s branches, what’s so special about my branch’s magic powers? And what’s so lacking about the bank’s headquarters abilities to do something simple? If you’ve any idea, please drop me a comment. The parallels between the current US presidential election and the last season of The West Wing are staggering. In the Guardian last week, Andrew Mueller draws up some useful lessons that Obama (and presuamably McCain) could learn from the TV series. In the past eight years, many voices have been ignored during the tenure of surely the least intellectually curious president in US history. A couple of episodes of The West Wing revolve around an initiative called Big Block of Cheese Day, in which White House staff take meetings with representatives of fringe interests, from map reformers to proponents of highways for wolves. "By the end of the day, there's always one or two converts, right?" notes Bartlet. In season four, genocide is perpetrated in a fictional African country clearly based on Rwanda. Where Clinton did nothing while a million people were hacked to death in 1994, Bartlet declares a new doctrine of humanitarian intervention, and sends in the army: "I got this intelligence summary this afternoon. Mothers are standing in front of tanks. And we're going to go get their backs." Probably the most emblematic episode of the seven-season run is the one entitled Let Bartlet Be Bartlet, which is to say: let a smart, educated, thoughtful, even "elitist" man play to those strengths, rather than pretending he has anything in common with any Joe the Plumber beyond a regard for their country's constitution and an interest in its future. Which is all he need have. It’s only a month shy of two years since I caught Casino Royale in a London cinema. All I can remember now of the loooong first film in this Bond trilogy was that Daniel Craig was excellent, the Bond girl was more ballsy than bimbo, and that the film seemed to have at least three endings. So on Friday night I ended up sitting in a Belfast cinema to see Quantum of Solace dressed up in a tux and bow tie, surrounded by more Aston Martin drivers than I thought possible in Northern Ireland. It’s not a great film. The plot’s very simple. (Spoiler Alert: Revenge x 2.) The opening theme is even more unmemorable than the previous. The baddie is commercially and politically conniving, but not outwardly sinister - though Greene’s a good surname for someone who only cares for damaging the environment! While the Bond franchise seemed to have grown up in Casino Royale, some of the lessons seem to have been forgotten in this film. Last time around, Bond physically suffered and picked up injuries. Last night, he talked about emotional pain and hurt, but seemed to be back wearing his Teflon superhero body armour and took punches without much grunting or groaning. There were few gadgets on offer. In fact, other than a Sony Ericsson phone (that makes the iPhone and Google’s Android look like a basic Nokia 3310) and some interactive table top displays (that could be a demo of what a 96 inch Apple tablet laptop might look like) there wasn’t much in the way of geekery. Product placement was all a bit obvious, with hydrogen-powered Ford SUVs (in the dessert?) and the new Ka on show. The film-makers even threw in a trip to Tosca which allows for some more “artistic” editing between the on stage opera and the off-stage commotion. The editing was breathtakingly fast, with few lingering shots, and hundreds of fast cuts in the set piece action sequences that gave the viewer an idea of what was going on but not enough time to take it all in or start asking questions. The dialogue seemed to go the way of the visual editing too, with much of the sparse conversation indistinct, like an episode of West Wing, but without the opportunity for subtitles. It’s as if producers no longer want to tell a story, but insist on the audience making up their own based on the clues they manage to pick up? Maybe they should pay us to go to the cinema, and not the other way around. 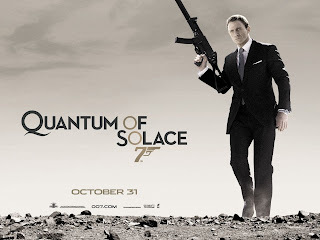 Unlike its predecessor, Quantum of Solace ends definitively. All of a sudden it stops. Mercifully short at well under two hours. It’s only now, looking back, that I realise that the action at the eco-hotel (note – batteries can explode) was the final crescendo. But at the time, I missed it, and expected there to be bigger and more obvious finale. Reflecting back on the film, there was little that hadn’t been done before. Lots of nice touches – like the coffins falling off a lorry – but little to excite or thrill. The best bits were not the stunts, pyrotechnics or CGI; instead the very human interactions between Bond (Daniel Craig) and the maternal M (Dame Judi Dench). I’ll be back to see the third in the sequence, but to find out if the franchise can recover than out of anticipation. And the quantum of solace I took from last night’s cinematic mediocrity was that the fourth Bourne film – Bourne Again? – to be directed by Paul Greengrass in 2010 will surely beat anything Bond has to offer. To be honest, I’m still not quite sure why I got an email out of the blue offering free tickets for the showing last night of Quantum of Solace at the Dublin Road Moviehouse. And when the tickets finally arrived in the post – special delivery and a very expensive stamp – the only clues were a Coke Zero logo and mention of Charles Hurst and Aston Martin. But we took the “Dress to Impress” seriously and turned up appropriately. And a big thank you to whoever decided that Alan in Belfast was due an invitation. I’d love to be able to illustrate this post with pictures of the two Aston Martin cars parked outside the Moviehouse doors ... but I didn’t take a picture on the way in, and they’d removed the cars by the time the film finished! Since the first three people I asked “Why are you here? How did you get tickets?” all turned out to be Aston Martin owners, I must keep my eyes peeled to try and spot them out on the roads of Northern Ireland. There were some “dazzling prizes to be won” as the credits rolled up the big screen. And there was also a Coca Cola watch, a year’s supply of Coke zero, cinema tickets and a meal at the Apartment up being handed out. Oh, and a PlayStation on which to play the new Bond game. I’m secretly glad that we didn’t win the Coke Zero. There was a party in the Apartment afterwards – great venue, brilliant vista over Belfast city centre – though no one seemed keen to point the tuxedo-wearing customers to the right private area, and there was certainly no explanation that only the Martini’s were on the house. The only photo of the night is a bad one, but you’ll be able to make out the fancily dressed cliental from the other upstairs bar in the Apartment, one fetching light shade that toned in well with the pink flamingo next to him! 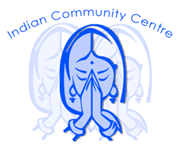 Just in time for Diwali - the festival of lights - Belfast’s Indian Community Centre has been awarded the gift of £56,000 from the Heritage Lottery Fund. The press talk about a previous bid for continued funding from “Stormont” (probably DCAL) was unsuccessful. Though my memory recalls that Edwin Poots disbanded the Community Festivals Fund (which may have been the ICC’s previous funding source) and made it the responsibility of local councils. But whatever the story, I’m glad to see the ICC being supported and kept stable. Indians have been part of communities across Northern Ireland for a long time, with many working in the health service (Littl’un was delivered by an Indian doctor). And over the last fifteen years, there have been increasing numbers working in the local IT industry - some even choosing to stay in Belfast and taking up official residency. The centre provides a hub for arts and cultural activities for the Indian Community across Northern Ireland, as well as reaching out to the wider community though open evenings at their base in Carlisle Circus (an old Methodist church!) … and presumably contributing to events like the August Belfast Mela - though they’re not listed on the website. 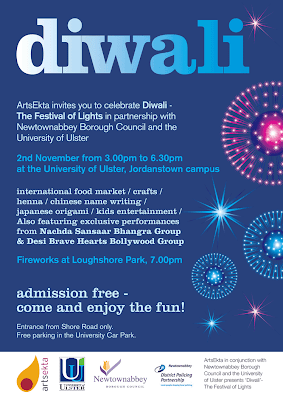 Tomorrow afternoon - Sunday - the University of Ulster and Newtownabbey Borough Council in collaboration with ArtsEkta are hosting a free event to celebrate Diwali out at the Jordanstown campus. From 3pm until 6.30pm on campus there will be international cuisine, crafts, henna, Chinese name writing, Japanese origami, childrens' entertainment along with music and a bollywood show with performances by Nachda Sansaar Bhangra Group and Desi Brave Hearts Bollywood Group. The event ends with fireworks down at Loughshore Park at 7pm. Diwali, or the Festival of Lights, is the most important festival in the Hindu calendar. It symbolizes the age-old culture of India which teaches to vanquish ignorance that subdues humanity and to drive away darkness that engulfs the light of knowledge.